Outdoor advertising is at its best when it does something surprising that grabs the attention of passers-by and gets people talking. We love three-dimensional billboards and always pay attention when we see those occasional ones featuring live actors on them. Lately, however, there has been a trend in the industry to create billboards that automatically react to their environment. A highway billboard advertising Volkswagen cars for example was fitted with cameras and software that could identify actual VW vehicles driving by, then flash them special messages. A recent billboard created by British Airways in London's Piccadilly Circus was paired with a technology that could identify BA airplanes flying overhead and display their origin or destination. 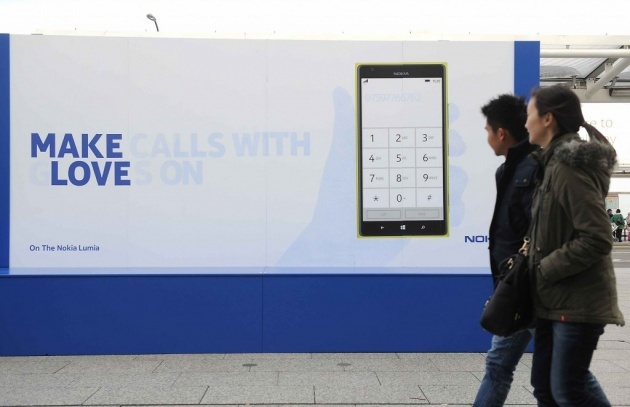 Now the phone maker Nokia has created a thermo-reactive outdoor ad that gets clearer as the temperature drops. The London-based billboard advertises a new touchscreen that is so sensitive it can be used while wearing ordinary gloves. As they say in advertising: Watch this space.